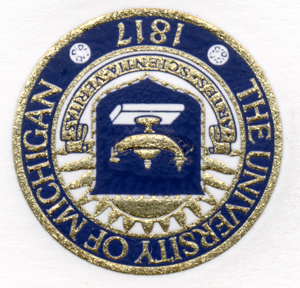 In many ways the University of Michigan has not only provided leadership for American higher education but its impact has occasionally extended far beyond the campus to have world-wide implications. (1940s) William Dow led Allied scientists in the design and construction of a 125-ton jamming device used to disable German and Japanese radar systems. (1940s) Alumnus Kelly Johnson, working for Lockheed, he established the legendary Lockheed Skunk Works and created the P-38, the F-104, the U-2 and the SR-71 Blackbird during a remarkable 40-year career. (1953) Jonas Salk, research associate and fellow in the U-M School of Public Health from 1940-44, developed in 1953 the polio vaccine. (1957) Alumnus John Sheehan, pioneered in 1957 development of synthetic penicillin, the life-saving antibiotic discovered in 1928 and developed ampicillin, a semi-synthetic penicillin taken orally. (1958) Faculty member C. Wilbur Peters and Lawrence E. Curtis developed a fiberoptic technique leading to medical endoscopy technology. (1964) Alumnus Jerome Horwitz, an organic chemist at Michigan Cancer Foundation, synthesized in 1964 the drug AZT, which is used to fight AIDS. (1986) Alumnus Stanley Cohen was co-winner of the 1986 Nobel Prize in medicine for discovering growth factors (proteins regulating cell growth) in human and animal tissue. (2000s) SPH and UM Cancer work on understand responses to chemotherapies.